A couple of entries ago we visited Medicine Wheel National Historic Landmark in Wyoming’s Bighorn Mountains. In this installment, we will look at many more points of interest an adventurous RVer will want to visit while in the vicinity of the Medicine Wheel. First off are two nearby waterfalls of considerable size. The first you will encounter is Porcupine Falls. The falls features a 200-foot thundering vertical drop into a pool at the base. The falls can only be viewed from the base requiring a short but relatively steep hike. The small opening in the cliff-face, about a third of the way up to the right of the falls, is the remnant of a tunnel that used to power a mining operation. Once you have explored Porcupine Falls, continue north down the road to Bucking Mule Falls. 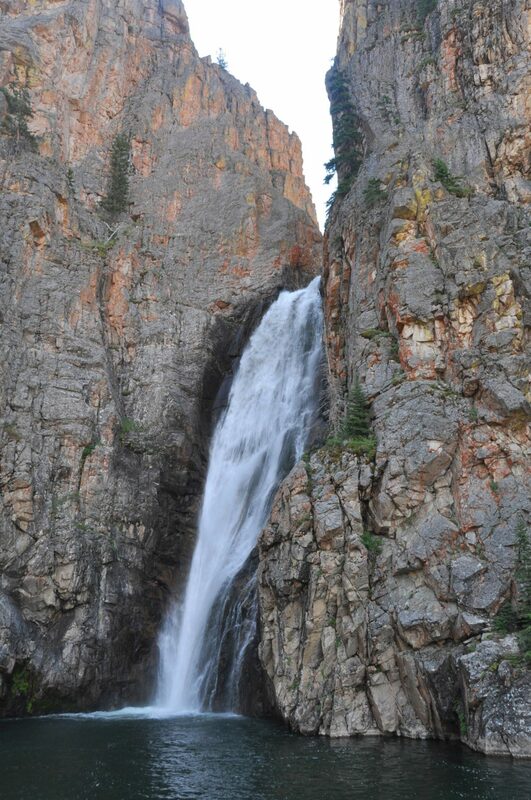 Many consider Bucking Mule Falls the most impressive waterfall in Wyoming’s Bighorn Mountains. The listed height of the falls varies depending on the source—some claim 300 feet, others say it’s up to a 600-foot drop. Realistically, the falls are comparable in height to Porcupine Falls. The hike to the falls viewpoint is considerably longer than Porcupine Falls, but not as steep as the falls can be viewed from the top rather than the base. 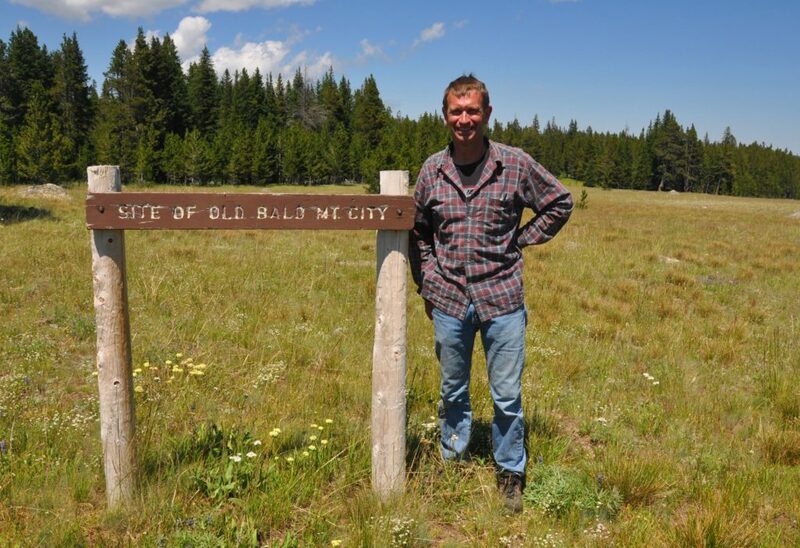 While the Bighorn Mountains were never a major source of precious metals, some mining did take place in the Bighorns providing some historic places to explore. Mixed among the beautiful places to boondock in the mountains you will find the remains of Bald Mountain City, the Fortunatus Mill, and a gold sluicing operation. “Discoveries of fine-grained gold north of Bald Mountain were made in 1890. ‘Gold Fever’ brought many prospectors to the area over the next 10 years. In 1892, the Fortunatus Mining and Milling Company purchased a group of claims on the head of the Little Big Horn River and Porcupine Creek. 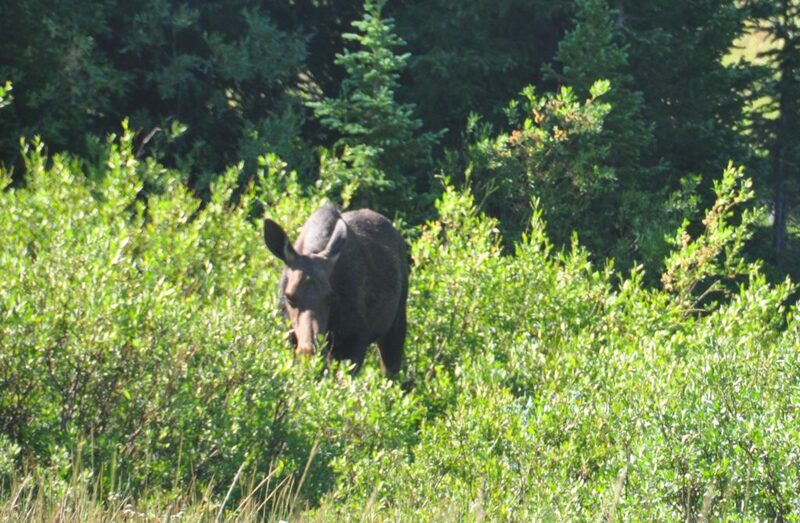 In addition to the waterfall and historical stops, be sure to keep a lookout for wildlife as you explore, as the area is a mecca for moose, deer, and other animals. The trailhead for Porcupine Falls is just off Forest Service Road 14 at N44° 51.465 W107° 54.770 — Click here for trail details. 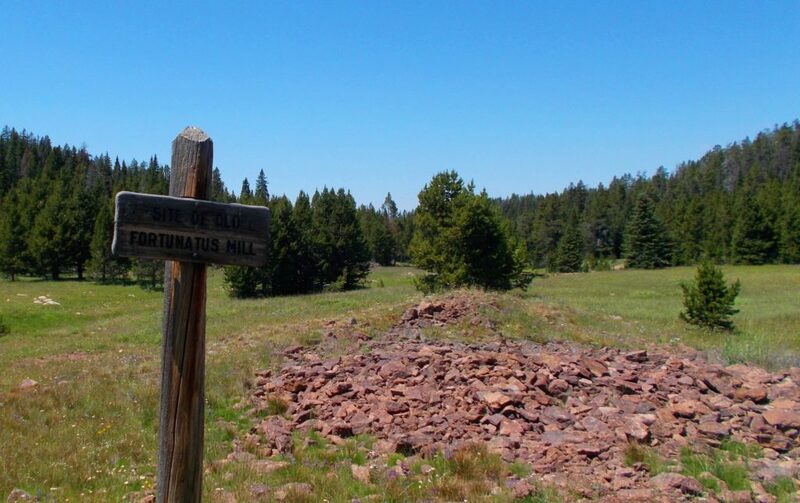 The trailhead for Bucking Mule Falls is just off Forest Service Road 14 at N44° 53.049 W107° 54.345 — Click here for trail details. 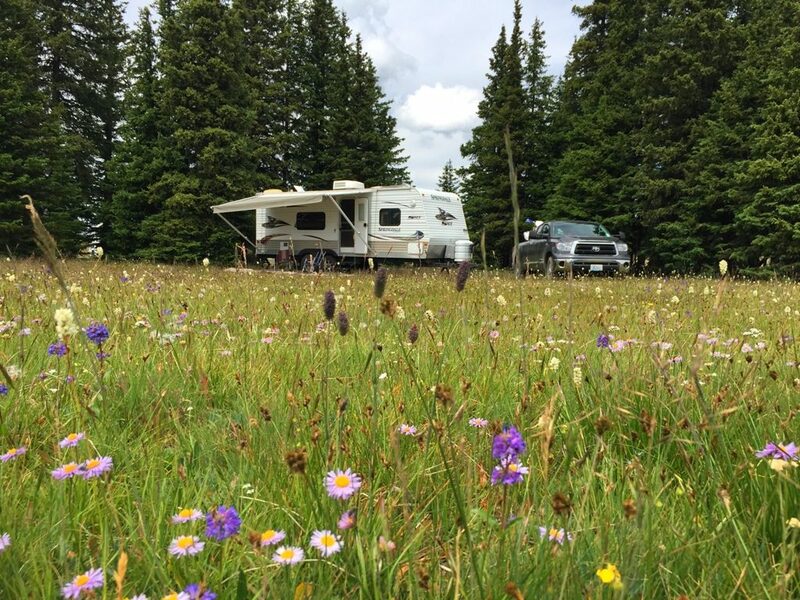 Developed campgrounds in the area include Porcupine Campground and Bald Mountain Campground. You can also choose one of the many boondocking sites along the roads mentioned above. Lots of exploring options from one camp, just another great adventure in RVing! Your photos look amazing. I would love to go here after reading your post.